1 click to deinterlace video. Change interlaced video to progressive video with the best video deinterlacing software. What is Deinterlacing? Why Need to Deinterlace Video? Deinterlacing video is the process of converting interlaced video, such as common analog television signals or 1080i format HDTV signals, into a non-interlaced form (progressive video). Interlaced scan and progressive scan are the two kinds of ways to record video. Interlaced scan video: This kind of video uses two sub-fields to generate a video frame in sequence. Field 1 scans odd lines of the image sensor, while Field 2 scans the even lines in the gap of Field 1. If you see a video listed with a letter "i" like 1080i, then it is an interlaced video. Progressive scan video: Also known as non-interlaced/sequential scanning, this kind of video draws the lines of each image in sequence from top to bottom. It is listed with a letter "p" like 720p or 1080p. Nowadays most cathode ray tube (CRT) computer monitors, all LCD computer monitors, and most HDTVs use progressive scan as their display resolutions are progressive by nature. To normally watch interlaced video on modern non-interlaced displays with better image quality, you have to deinterlace the video first. What's the best software to deinterlace video? Some of you may use Handbrake to deinterlace video which is a little bit complicated. Here we'll introduce the easiest video deinterlacing method for you. Check below how to deinterlace video with the best video deinterlacing software in 1 click. With the built-in "Yadif Double Frames" video deinterlacing engine, this program allows you to easily convert interlaced scan video to progressing scan in one click, to achieve optimized image quality. Other powerful functions include: 1) Free download 8K/4K/1080p/720p HD movies videos from YouTube and 300+ sites; 2) Convert any popular video like HEVC, MKV, AVCHD, AVI, WMV, MP4, etc. at ultrafast speed; 3) Edit, trim, crop, subtitle video; 4) Convert DVD to MP4 and more; 5) Record computer screen/record webcam. WinX HD Video Converter Deluxe, a professional video deinterlacing program, can help you easily turn interlaced video to progressive scan video with its built-in Deinterlacing Engine. It is not merely a video deinterlacing tool, but also a powerful video converter, online movie/video free downloader, video editor, DVD converter, video recorder, etc. Convert video: Enable you to flawlessly convert almost all popular videos, like convert HD MKV, H265/HEVC, AVCHD, M2TS, SD MP4, AVI, WMV, MOV, FLV and more from one format to another at fastest speed (5X faster than others) without quality loss. Download video: Free download 8K/4K/1080p/720p HD movies/videos/TV shows/MP3 songs from YouTube, Dailymotion, Vimeo and 300+ sites. 2019 best Hollywood/Bollywood movies can be free downloaded for offline playback with no hassle. Edit video: Cut video, crop video, split video, merge video, rotate/flip video, add effects/watermark/subtitle to video, convert video to GIF, and more. Convert DVD: Fast convert DVD/ISO Image/Folder to MP4, AVI, WMV, MOV, MKV, H.264, HEVC, iPhone (X), iPad, Android and other hundreds of video formats and devices. Record screen/webcam: Record movement of entire computer screen, record a specific window, record any needed area of screen by freely cropping. Record webcam video. How to Deinterlace Video in 3 Steps with Best Video Deinterlacing Software? 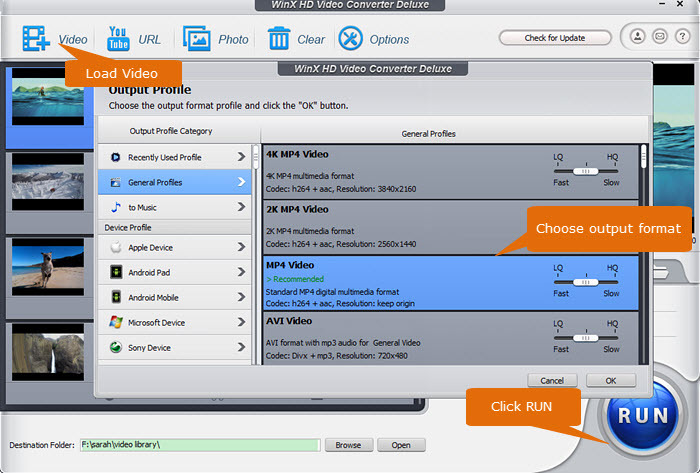 Free download and install WinX HD Video Converter Deluxe on your Windows 10/8/7 or Mac computer and follow the easiest guide below to deinterlace video. Launch the best video deinterlacing software and click "Video" -> "+Video". Select the interlaced scan video from computer and load it into the program. Almost all popular videos are supported as input. Specify an output video format like MP4, etc. in the Target Format column. Optionally do some edits to the video and click Codec Option button to adjust video/audio parameters like resolution, frame rate, etc. if you need. Then tick the "Deinterlacing" button on the main UI. Click "Browse" to set a destination folder to save the deinterlaced video. Hit "RUN" to start the video deinterlacing process to convert it into non-interlaced form. Deinterlacing - Deinterlacing requires the display to buffer one or more fields and recombine them into full frames.